You may have seen in my recent beauty haul post (see that post here) that I picked up some items from one of my favourite places to shop online for beauty products, Escentual and since Escentual had a discount on all French pharmacy brands throughout April, I decided to take advantage and order a few things, one of the things I picked up was the Vichy Normaderm Night Detox. I love Vichy as a brand and have yet to be disappointed by any of their products, so I had high hopes for the Night Detox but not only because of my love for Vichy but also because one of my good friends Gemma had recommended it to me too. My skin has been terrible since the beginning of this year, I have suffered with so many blemishes it's unreal, I have never really had a problem with spots, even as a teenager I just never got them, maybe it's something to do with me having super dry skin but I've never had a problem until the beginning of this year when I started to get big cystic type spots, mainly on the lower part of my face but I do sometimes get the odd one between my eyebrows too. I think the sudden blemish party my skin seems to be having maybe something to do with me suffering from PCOS (polycystic ovarian syndrome) because I have heard of some other people who started having a problem with blemishes in their 40's who also suffer with PCOS, but other than that I can't think of any reason at all why my skin has suddenly gone haywire, it is also severely dry and dehydrated too, so as you can imagine, it's not a pretty sight. 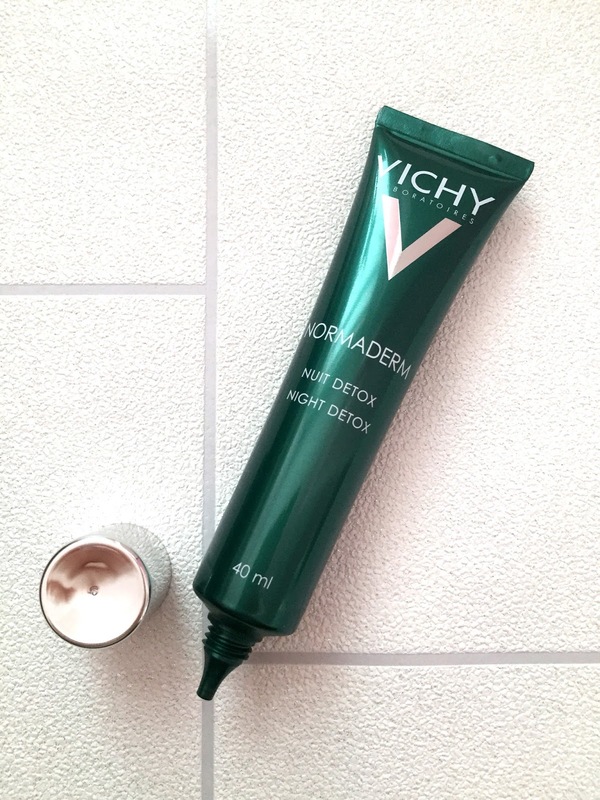 Target the causes of oily skin as you sleep with the purifying Vichy Normaderm Night Detox moisturiser. Normaderm Night Detox is ideal for both teenagers and adults whose skin produces too much sebum over night, which can lead to blemishes and greasiness. Designed to regulate your complexion during these crucial twilight hours, the lightweight fluid offers oil-free, targeted care that’s even suitable for sensitive skin. The supercharged formula tightens pores, evens the skin’s texture, reduces imperfections and enhances radiance for clear and purified skin upon waking. Though powerful and effective, Normaderm Night Detox is kind to the skin, with an infusion of Vichy’s famously soothing thermal spa water. Apply every night to clean and dry skin, avoiding the eye contour area. Tested under dermatological control, paraben-free, hypoallergenic and non comedogenic. I apply the Normaderm Night Detox to the areas of my skin where I have the blemishes before I go to bed, if I can feel a blemish under the skin, I will pop some on, I also put it on blemishes that are already causing a problem and area's of scaring too. You can apply the Night Detox all over your face, this is how it is meant to be used, but because my skin is super dry and not at all oily or greasy I find it best to apply it just where I need it. The Night Detox has a nice light texture to it and it sinks into the skin well without leaving any residue, it is white in colour and has a nice light consistency, it also has a very light scent to it that doesn't linger. The first time I used the Night Detox, I had a lump where a huge cystic spot was developing, it was mostly under the skin and was sore to touch. I applied the Night Detox to the spot and also to some area's of new scarring from other blemishes I'd recently had. I was stunned in the morning when the lump was no where near as sore and had gone down dramatically, I continued to use the Night Detox on the spot/lump and within 3 or 4 days it had disappeared completely and the area of scarring I used it on was also looking much better. I was so shocked and didn't expect such fast results, I have used the Night Detox on every blemish or lump I get since purchasing it and I get brilliant results every time and I have noticed that I don't seem to be getting anywhere near as many blemishes or under the skin cystic type spots in the area's I've been using the Night Detox so I am going to start applying some every night along my jawline and in other area's I suffer with the blemishes. I have also noticed a change in the scarring on my face too, it has reduced a lot in the area's I have been applying the Night Detox so I am really pleased with the results so far and I am so happy I took Gemma's advice and purchased this. 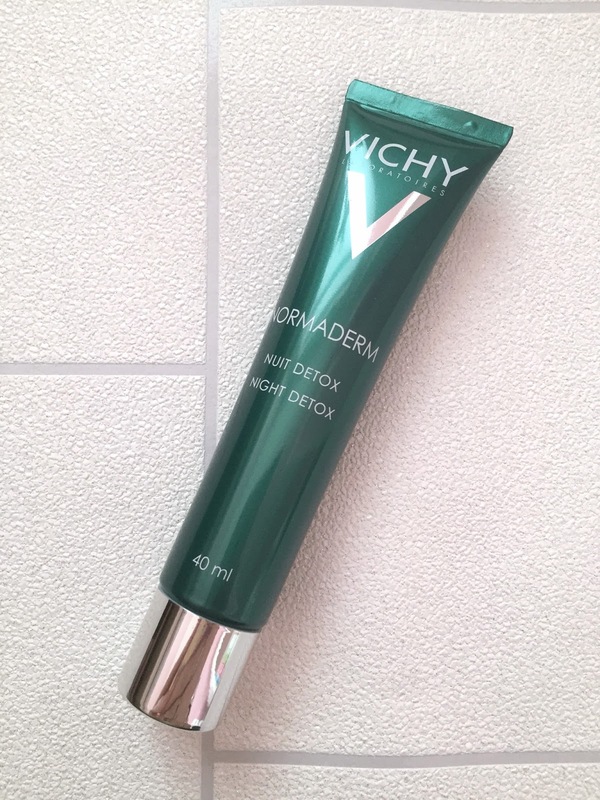 I use the Vichy Normaderm Hyaluspot during the day on my blemishes and scarring and love this product too, but I think the two products combined are making a huge difference to my skin and I am extremely pleased with the results. If you suffer with blemish prone skin and scarring I would highly recommend the Normaderm Night Detox, it really does do exactly what it says on the tin. 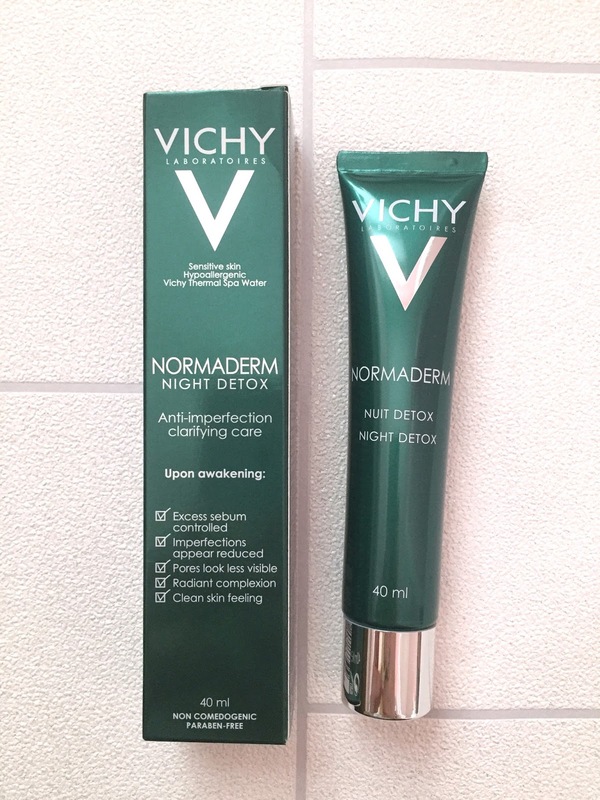 Have you tried the Vichy Normaderm Night Detox? What are your thoughts?